Jim Steinman’s smash-hit rock musical Bat Out of Hell roars back into the West End, playing at the Dominion Theatre following a sold-out opening at the London Coliseum. Based on Steinman’s iconic collaborations with legendary singer Meat Loaf, Bat Out of Hell is the romantic, adventurous story of forbidden love. Originally premiering at Manchester’s Opera House, the production played a limited season at the London Coliseum in summer 2017, which extended due to popular demand. 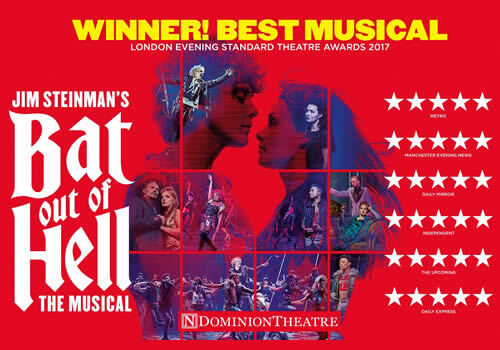 After tremendous success in London, which included swiping the Evening Standard Radio 2 Audience Award for Best Musical, Bat Out of Hell transferred to the Ed Mirvish Theatre in Toronto. 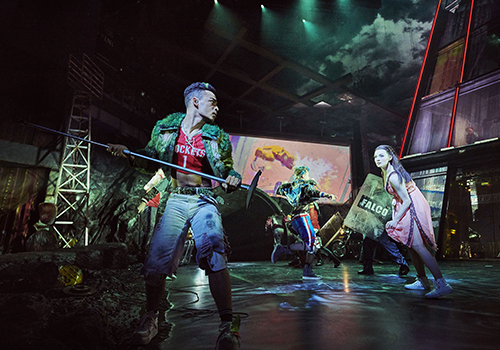 Set in a wild, dystopian world, Bat Out of Hell the Musical follows Strat, a rebellious youth who falls in love with the daughter of tyrannical Falco. A high-octane adventure that soars through an impressive back-catalogue of songs, Strat embarks on a romantic journey against the backdrop of a post-cataclysmic city. Featuring songs such as “I’d Do Anything for Love… (But I Won’t Do That)”, “Dead Ringer For Love”, “It’s All Coming Back To Me Now” and, of course, “Bat Out of Hell”, this rock ‘n’ roll musical guarantees to set the stage on fire. Casting includes the Jordan Luke Gage as Strat and Christina Bennington as Raven, alongside Rob Fowler as Falco, Sharon Sexton as Sloane, Danielle Steers as Zahara, Giovanni Spanó as Ledoux and Patrick Sullivan as Blake, as well as newcomers Alex Thomas-Smith as Tink and Wayne Robinson as Jagwire. Returning ensemble members include Emily Benjamin, Georgia Carling, Natalie Chua, Jonathan Cordin, Hannah Ducharme, Isaac Edwards, Aston Newman Hannington, Eve Norris and Courtney Stapleton, alongside Kyle Anthony, Christopher Cameron, Rob Copeland, Collette Guitart, Eric Hallengren, Vicki Manser, Rhianne-Louise McCaulsky, Joseph Peacock, Kyle Roberts, Craig Ryder, Dawnita Smith, Julie Stark, Charlotte Anne Steen and Sam Toland. 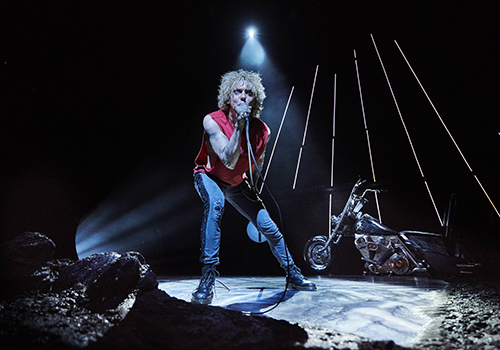 Directed by Obie Award-winner Jay Scheib, Bat Out of Hell features choreography by Emma Portner and design by Jon Bausor, as well as lighting design by Patrick Woodroffe, sound design by Gareth Owen, video design by Finn Ross and orchestrations by Steve Sidwell. Bat Out of Hell the Musical returns to the London stage due to phenomenal demand, playing at the Dominion Theatre. Bat Out of Hell the Musical is suitable for those aged 12 and up. Under 5's will not be admitted.